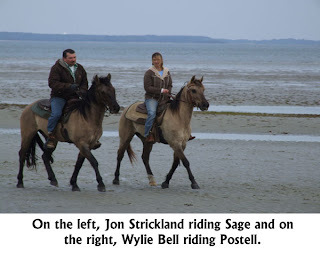 In an effort to continue the American Livestock Breeds Conservancy’s work on the Pineywoods cattle, Florida Cracker sheep, and Natchez Trace horses, Jeannette Beranger, ALBC’S technical program manager, traveled to Mississippi and Florida this past fall. The goal of the trip was to meet with breeders, collects hair samples, and document several lines of Pineywoods cattle, the Ezell line of Florida Cracker cattle, Natchez Trace horses, and several lines of Florida Cracker sheep. The trip south began with landing in Jackson, MS, not far from the famous Natchez Trace. Landing in the area was an opportunity to learn about a group of horses in the trace that are suspected to be a remnant population of extremely rare Pine Tacky horses. Pine Tackies, or “Saddle horses” as the locals call them, are a suspected population of the Colonial Spanish horses brought to the area with the Spanish conquistadors and Native American trade routes of the early colonial period in America. 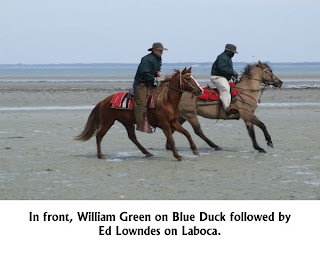 There are only three Pine Tackies (all stallions) known to exist, thus far, and it’s of great interest to ALBC from a conservation standpoint to determine if there are some hidden pockets of these horses in the region. 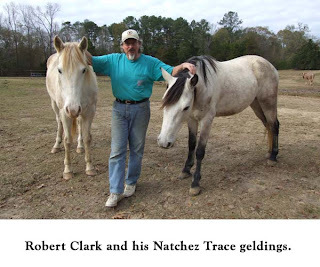 Robert Clark and his wife Janice have two horses of the Natchez Trace. They invited ALBC to see their horses and learn what they have uncovered about the population in the area. Robert, a landscape architect and local historian, shared the historical data reaching back to the 1700s that he has managed to gather about the horses. Robert, who was born and raised in the area, has always had an interest in the local horses, but it was not until he spent time in the field ph otographing Pryor Mountain horses that he made the connection that the horses of his childhood might possibly be Spanish in origin. The Clarks recently bought two of the horses from locals and have been interested in learning as much as they can about their origin. Both horses had physical features consistent with Colonial Spanish horses and ALBC has subsequently submitted DNA samples from them to Texas A&M University and is now awaiting the results to get more conclusive evidence supporting the Spanish origin of the horses. In the meantime, the Clarks continue to search for other horses in the trace and hope to find some breeding stock that can be used to start a small conservation herd on their farm. The following day began with meeting Billy Frank Brown of Poplarville, MS. He and his son Jess maintain one of the largest herds of Pineywoods cattle and a large flock of Gulf Coast sheep. The Brown family has a long history with these breeds on their historic farm that still retains structures dating back to the 1860s. The first step in the investigation was to visit several farms close to the Brown farm that keep cattle and sheep. ALBC is particularly interested in documenting the phenotype and status of sheep and cattle from the old lines including the Dedeaux line of Pineywoods since there are just a handful of them left in existence. Following the visits to surrounding farms, the day continued by documenting animals belonging to the Brown family. Their animals represent several rare lines found in both breeds and are vital to the overall genetic diversity of the breeds. Many of the cattle needed to be described for the studbook, so we photographed and documented as many as possible that afternoon. 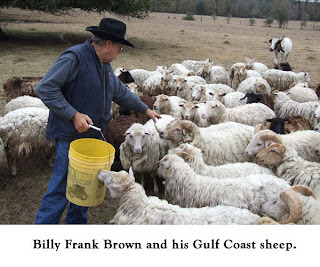 While on the Brown farm, we spent some time with the Brown’s large herd of Gulf Coast sheep that seemed to follow Billy Frank as if he were the “Pied Piper.” The sheep came in all sizes and colors and it was a sight to see as 100 or more came running towards us. Among the sheep was one of the three Pine Tacky stallions that belong to the family. 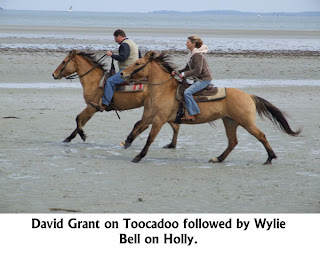 The original herd of horses dates back with the family to the 1800s and the three stallions are the last of their kind unless the Natchez Trace horses prove to be related. The three Brown horses have already been DNA tested and were found to be Colonial Spanish and most closely related to the Marsh Tackies of South Carolina. Later in the afternoon Justin Pitts, a fellow Pineywoods breeder, joined Bill and Jeannette as they finished the day by visiting several sites off the farm where additional Brown cattle were being grazed. Day two began with a stop at the farm of Charlie Carter. 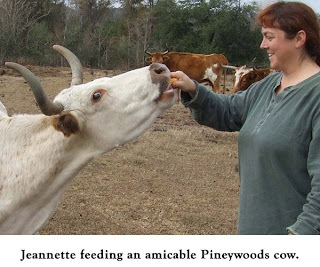 Justin, Bill, and Jeannette were welcomed by Charlie to his family farm that where Pineywoods cattle has been on the property since the late 1800s, primarily for logging. We drove into the fields to view Charlie’s 100+ cattle that came in every color imaginable. The Carter cattle are largely managed on natural forage available on the property and are supplemented with hay. Of particular importance is the native switch cane (Arundinaria gigantean) that is a winter staple for the cattle in the region. Charlie told the group of his family history and how the cattle have been bred and maintained throughout the years. Following the visit to the Carter farm, Justin and Jeannette were joined by Robert Conway, a former Pineywoods breeder. They made their way to the farm of Fred Diamond. 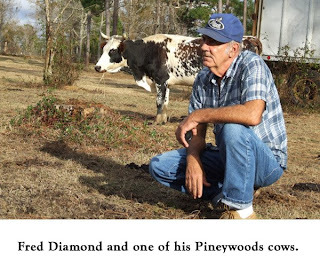 The Diamond family has been on this farm since 1800 and has raised Pineywoods cattle on the land for most of that time. The Diamonds keep a large herd of cattle that have been bred for both meat and dairy qualities and coupled with selection for good temperament. The Diamond herd is the only known herd being selected for dairy, making it an extremely important trait that would be a great loss for the breed should they disappear. Fred showed off several cows with impressive udders including his famous “purple cow” (an animal whose deep red roan color has an almost purple-like appearance) that provides up to two gallons of milk a day for the family. The day’s journey continued to the farm of Lionel Ladner. Lionel keeps a small herd of Broadus line Pineywoods that offer nice beef qualities in the breed. Lionel prefers Broadus line cattle because he likes their look and productivity for meat, so he plans to breed this line exclusively. The day was getting late (and dark), but Justin decided to have us make one more stop up the road to the house of Lionel Ladner’s brother-in-law, Shoat Broadus. As expected, his cattle were much like Lionel’s herd reflecting meat- oriented phenotype versus the dual-purpose body type we saw earlier in the day at Fred Diamond’s farm. The visit with Shoat ended and shortly afterwards Justin, Robert, and Jeannette made their way to the Brown farm to re-join Bill and have a Pineywoods roast dinner with the rest of the Brown family including his wife Julie and their son Jess. After dinner, Jess and Jeannette got to work reviewing photos of the Brown herd that had been taken over the past couple of days. Jess had an uncanny memory of every cow on their property and its lineage or at the very least the line it came from. Over a 4-hour period, hundreds of photos were reviewed making it possible to identify a majority of the cattle in every image. The information gathered will be used by Phil Sponenberg for the breed studbook and to help identify phenotype within the various lines of the Pineywoods breed. The following morning the day started by heading straight out to the pastures with Jess to take a look at some of the old Ladinier line cows that he’s kept to ensure their genetics do not disappear. Some of these amazing 25+ year-old cows were still having offspring on a regular basis up until a year or two ago when they were retired from breeding, according to Jess. We pulled hair samples from each of his old “grand dames” for DNA analysis for comparison with other lines within the breed. Before leaving for the next leg of the trip, Jeannette said her goodbyes to the Browns and gave a big thanks for their hosting the visit and for the huge amount of information they provided to ALBC to enhance our understanding of the native livestock breeds in the region. Throughout the later half of 2008 and the early party of 2009, ALBC has been conducting heritage turkey workshops throughout the country. The first of these workshops we held in July of 2008 at Peregrine Farm in Pittsboro, NC. The workshop was full with 40 participants coming from all different locations including, North Carolina, Maryland, Virginia, South Carolina, Georgia, and Florida. Frank Reese was the instructor for the North Carolina workshops. Frank operates Good Shepherd Turkey Ranch and he is the link for most of us to an era when what we now call “heritage turkeys” were highly productive and always raised outdoors. Three more workshops are being held during the first quarter of 2009 – one a month. Danny Williamson is the clinician for these spring workshops. Danny has been raising turkeys for 13 years, learning under the tutelage and careful eye of Frank Reese. Over these 13 years, Danny has become a master breeder, General Manager, and CFO for Good Shepherd Turkey Ranch, the marketing arm for the 10,000 plus turkeys that Frank, Danny, and several growers raise for the holiday market. The first of the 2009 workshops was held in January in Live Oak, Florida, a small town about half way between Tallahassee and Jacksonville. Elena Toro, an extension agent in Suwannee County, jumped on the opportunity to host the workshop, providing significant logistical support and fabulous publicity. The workshop was a success and provided a valuable learning experience for those who attended. February’s event was held in Adams Run, South Carolina, about 25 miles west of Charleston. ALBC member Sam Ormont was the host. Sam raises Narragansett turkeys on his farm. 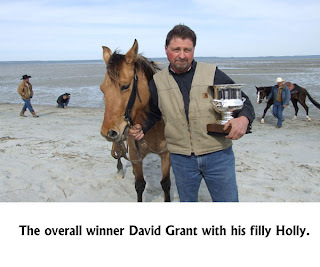 In Adams Run we actually held two clinics – one for breeder selection and the second on husbandry. The breeders group was small but attentive. Several people had attended husbandry workshops in other states and were ready to begin managing their own breeding stock. In the morning we covered history, ideal conformation, and faults. In the afternoon we donned white biosecurity suits and booties and applied what we’d learned to the real thing. The goal was to develop an understanding of the ideal, an eye for ideal conformation, and a feel for the same. This was a good group of students. The husbandry workshop began the following day, using the same pattern that had been established in Florida. While there were fewer attendees, there appeared to be a core group who are beginning to explore working cooperatively from breeding and hatching to purchasing feed and marketing. In March, ALBC will be in Wheatland, Missouri, which lies midway between Springfield and Kansas City. Bill McBrayer will be the host. These workshops have all been a great success for ALBC, but more importantly for the turkeys, the breeders, and the producers. There is a clear desire for more breeder selection and husbandry clinics on more breeds and species is clear. People are hungry for the information and the first hand knowledge that comes with years of experience and dirt under the nails. ALBC will pursue additional funding to make such offerings available. On February 22nd, ALBC staff member, Jeannette Beranger traveled down to Hilton Head Island, SC, to be the emcee for the Marsh Tacky races that occured on Mitchelsville Beach. 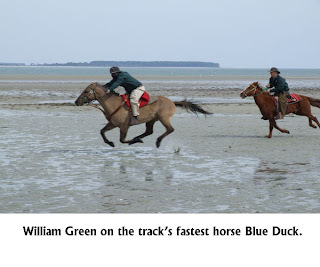 The races, which had not occured in more than 50 years, were a true success and testament for the breed. With fewer than 200 of these horses remaining, it's critical that conservation efforts are made. Want to learn more about Colonial Spanish horses? Check out ALBC's breed abstract. Missed the races? Don't worry, you can check out the video on Youtube by clicking here.